David Ben Leavitt has been a stage manager, lighting designer, and set designer as well as a director. He has also appeared on-stage in roles as varied as Mr. Bunthorne’s Solicitor in Patience, Dr. Chumley in Harvey, and Sir Toby Belch in Twelfth Night. Charla Bendas has long been involved with local theater as a producer, stage manager, and director, in addition to appearing on-stage. Charla, along with husband Charles, recently directed Trip to Bountiful with the Players and Into the Woods for Playcrafters; they are currently directing Hello, Dolly! for the Rose Valley Chorus & Orchestra. Kathleen Carlin became involved in theater while doing volunteer work in Aberdeen, Scotland; when she returned to the United States she studied acting at the Walnut Street Theater. Favorite roles include Laura in The Glass Menagerie, Ginny in For Whom the Southern Bell Tolls, the Leader of the Grey Gentlemen in Momo and the Grey Gentlemen, and Holly Adams in An Act of the Imagination. Ben Hynson is appearing with the Players for the first time, but is not a novice on-stage. He sang for eleven years with Choral Society of Chester County, and he has appeared in all thirteen extant Gilbert and Sullivan operas with the five local G&S groups. Other favorite shows include The Merry Widow, Once Upon a Mattress, Sunday in the Park with George, and Jacques Brel is Alive and Well and Living in Paris. Janice Jankowski debuted with the Players as Emma Borden in Blood Relations; other favorite roles on our boards include Freda in Dangerous Corner, Iris in June Groom, and Phoebe in Murder in Company. She has worked backstage both on crew and as a producer. Christopher DeWitt recently directed and appeared as Charlie Brown in his own rendition of A Charlie Brown Christmas. Chris was Assistant Director and Stage Manager for our recent production of Rumors, and has appeared on-stage here in The Crucible and June Groom. He has also worked on dramaturgy for the independent production GWM seeks…. 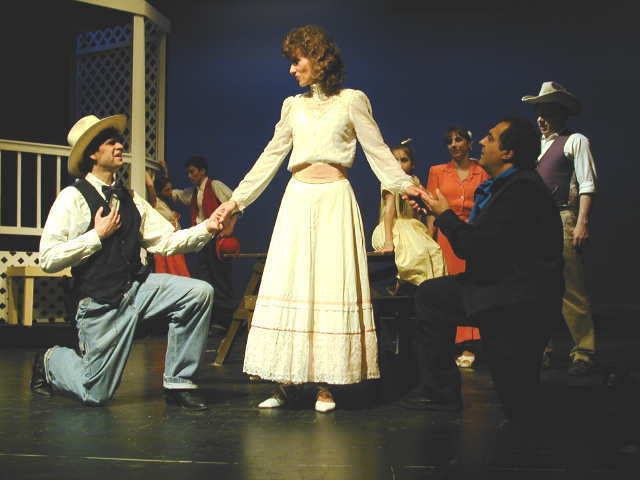 Jim Ludovici is performing in his eighth show with the Players since Into the Woods in 1998. Other groups he has appeared with recently include Barleysheaf Players, Playcrafters, and as an understudy at the Arden in Philadelphia. Favorite roles including John Proctor in The Crucible, Tito in Lend Me a Tenor, and Jigger in Carousel. Julie Ann Marra studied acting at West Chester University. Favorite roles included Estelle in No Exit, Cecile in Les Liaisons Dangereuses, Mae in Cat on a Hot Tin Roof, Jesse in Night, Mother, Bananas in House of Blue Leaves, and Lenny in Crimes of the Heart. Performances May 11, 12, 13, 18, 19, 2001.